Sometimes it’s hot. Sometimes it’s so hot and the windows in the room you’re in won’t open because there are no windows in the room you’re in. The room is windowless and hot. The room is essentially the worst place in the entire universe. Very little air movement. It’s like a sauna. And not in a good way. Very little air movement, very little relaxation, very much terrible. But then the door opens. It opens just enough that a slight sliver of fresh air makes its way through, offering a brief and delicious and delightful and oh so welcoming reprieve from the stuffy heat of the windowless room, essentially the worst place in the entire universe. The Marvelous Mrs. Maisel is that slight sliver of fresh air. Amazon’s new show, which took home Golden Globes for Best Musical or Comedy Television Series and Best Actress in a Musical or Comedy Television Series (Rachel Brosnahan) at last Sunday’s shindig, is nothing short of straight up fantastic. Like that slight sliver of fresh air it’s full of life, exciting, whimsical and endlessly enjoyable. Also, it’s hilarious. Anyone who suggested you watch it should be listened to, then applauded, thanked and probably given some sort of gift. A bottle of wine would probably do the trick. 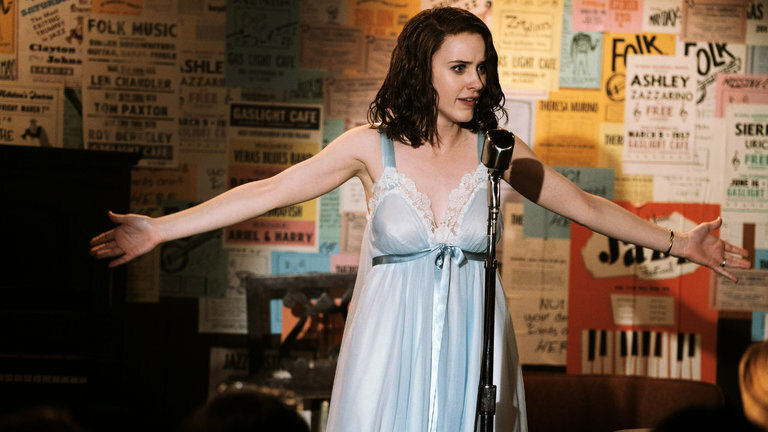 Brosnahan plays the show’s title character, Miriam “Midge” Maisel, and without getting too far into it, the almost 30 year old Jewish house wife willfully embedded into New York city’s upper west side in the 1950’s responds to some recent upheaval in her life by adventuring below Central Park and into the fledgling comedy scene happening down in the Village. Cops are on hand to watch the language, that could be Allen Ginsburg over there (or just a dude who looks like him,) there’s geographically informative spoken word performances and comedy legend Lenny Bruce sliding in and out of the story (and police stations.) By the third episode, Bruce has become a reoccurring character, having formed somewhat of a professional kinship with Maisel. The show looks beautiful and it feels like theater. The fast-moving dialogue has a vigorous clip to it and seems to bounce effortlessly from character to character. A character will talk to themselves, another character, then themselves again sometime in the same breath. Meanwhile, an active camera gives the show the feel of one of those live-action performance jobs the networks have become so found of, most recently the live version of A Christmas Story that was done this past December. The camera work is as fluid and sprightly as the dialogue as cameras closely follow behind characters from room to room, place to place, neighborhood to neighborhood, giving the viewer the sense that you’re not just watching the show, but are an in-person bystander. It’s fascinating that a show about the rocky navigating of personal and cultural shifts and changes can be filmed so smoothly and work. It’s been a couple months since I felt so refreshed and relieved while watching a show, so happy to have a welcome form of escapism to sink into and use to dodge the ugliness happening damn near everywhere around us. Other shows have premiered since The Good Place returned this fall and there’s been plenty to dive into and enjoy, but nothing that rivals the way The Marvelous Mrs. Maisel is able to create a melting of the stress caused by whatever He Who Shall Not Be Named did this time. For instance, last night, put the little one to bed, came downstairs and spent a couple minutes staring into the abyss of the bottom as CNN recounted the President referring to some countries as “shithole countries.” Depressing, dark stuff. But what good could go from continuing to watch as pundits shook their heads in disbelief and anchors tried to avoid saying “shithole?” Nothing. Thankfully we had The Marvelous Mrs. Maisel to turn to, banged out two episodes and were able to hit our pillows with thoughts of Miriam and Bruce and the color palettes of the 50’s and the coolness of jazz groups dancing in our heads. The ugliness was there in the morning, but for a brief spell it wasn’t and that was thanks to The Marvelous Mrs. Maisel. I then realized at 3am, up for an entirely different reason, that comedy was the best way to combat the world we are currently living in. It’s the method of choice when it comes to escapism. 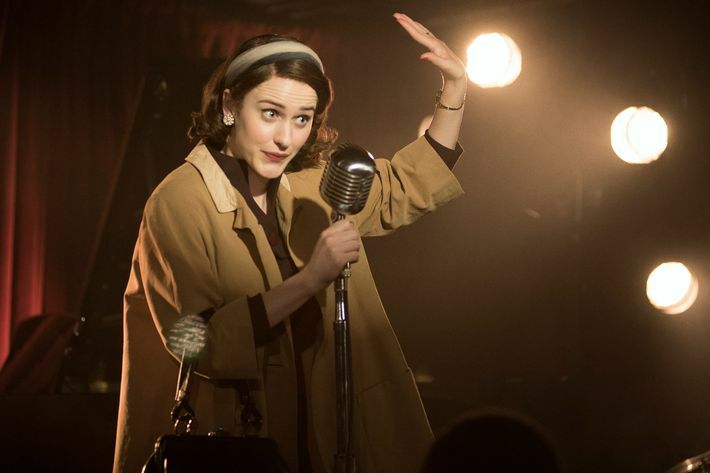 The Marvelous Mrs. Maisel worked in ways The Crown wouldn’t have been able to and that’s not a knock on season two of The Crown, but it is true. Brooding and sobriety wouldn’t have helped on a night like last night. Levity and a whimsical jaunt through late 1950’s New York City were what was needed. There’s a good chance it will be tonight as well. But at least we have a show like The Marvelous Mrs. Maisel to get us through.